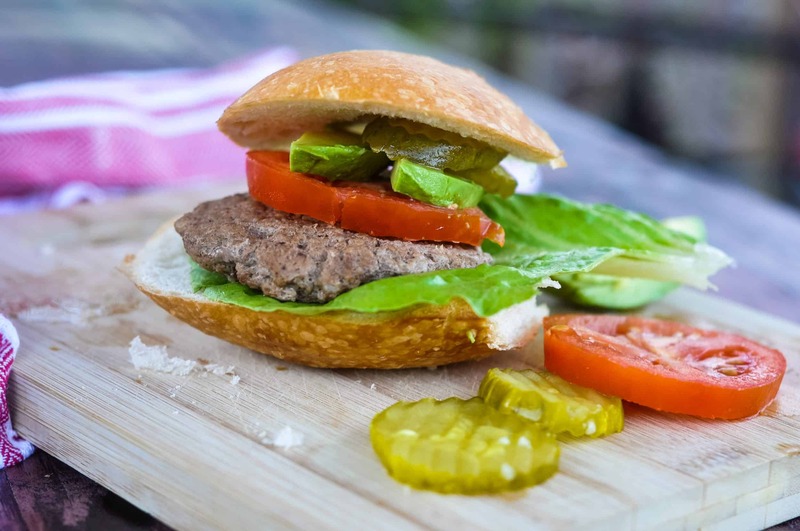 Juicy & flavorful, this classic burger recipe includes garlic and a few other special ingredients to make a mouthwatering hamburger. You don’t even need a grill to make the best burgers ever – these stand on their own two feet! Everyone needs a few tried-and-true recipes that can be pulled out for any occasion and always win. 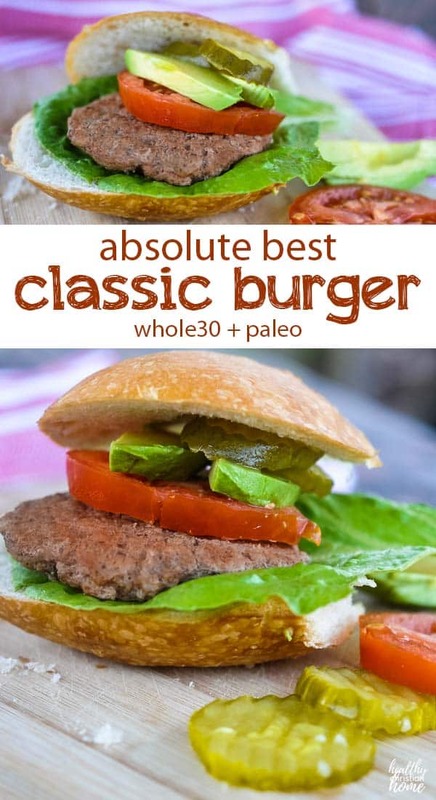 This classic burger is at the top the list! 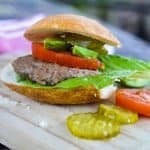 Perfect for summertime grilling or baking in the oven on a chilly day, these burgers are versatile for every season and come together really quickly. I haven’t always been a huge burger fan. Burgers can be pretty tasteless. A plain patty of squished meat that needs to be ‘doctored up’ with cheese and sauces before it tastes good. 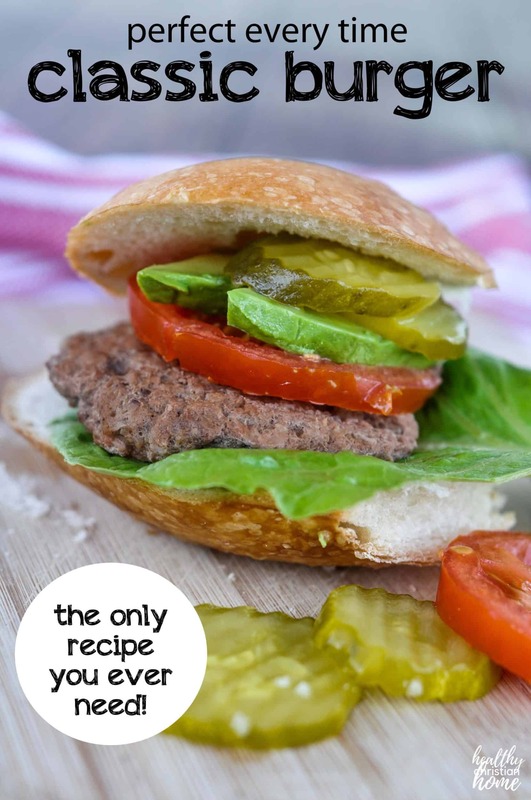 So, I wanted to create a burger recipe that tastes wonderful on its own – no boatloads of ketchup and mayo required. Quality ground beef and/or lamb: For best results, we love using 1 lb. lean beef and ground lamb. Lamb can be more difficult to find in some areas (and more costly), so feel free to use all beef. Make sure it’s lean so your burgers aren’t swimming in fat while they bake. I love using grass fed beef from ALDI. Garlic: Minced garlic is KEY to the incredible flavor of these burgers. Don’t skimp on it! Mustard: Use a bit of classic yellow or dijon mustard to add an extra bite to your burgers! Liquid Aminos: Bragg liquid aminos is a healthier alternative to soy sauce with 16 amino acids. A liquid protein concentrate made from soybeans, they are gluten free, non-GMO and with lower sodium than soy sauce. Worcestershire sauce: This savory blend of vinegars, onions, garlic, molasses, adds a perfect flavor boost to these burgers. Find out more the history of worcestershire sauce. Seasonings: There’s plenty of leeway here, so get creative and use your favorite seasonings or even cayenne to spice things up! I used a simple blend of paprika, salt, and pepper. Remember to make your patties larger than you want the final result to be – they will shrink somewhat as they cook. Flip halfway through cook time to ensure even cooking. These burgers can be made on a grill or in the oven. We love oven baked burgers! A sheet pan with baking rack (like this) is a wonderful tool to have for making these hamburgers – any excess grease can drip to the bottom during cooking. Juicy & flavorful, this classic burger recipe includes garlic and a few other special ingredients to make a mouthwatering burger. You don’t even need a grill to make the best burgers ever – these stand on their own two feet! Hand mix all ingredients in a large bowl. Form into patties and place on a baking sheet. Bake @ 350 for 20 minutes, turning once halfway through. This recipe is written for oven baked burgers, but they can also be grilled.